Do as I say, not as I do. The pulled pork in this photo is not the best filling for this dish. The un-photographed pork belly was superior in every way and will be a future post. That disclaimer out of the way, these steamed buns are fantastic and very simple to make. My process for picking out a recipe is to read the top 5-10 results from a google search and seeing what the common threads are. I settled on the Steamed Bao Buns recipe from BBC Good Food because it included the common ingredients (vinegar and milk) and best of all was in weight measurements. After making this recipe several times I have adapted it slightly. I almost never have milk in the house but I keep dried milk powder for baking. Instead of reconstituting the milk before adding it to the recipe, I just add the powder to the other ingredients and increase the amount of water. I’m also lazy and as you don’t need to re-hydrate or awaken instant yeast, I just toss that into the bowl too. When it comes to shaping, after the first time making these I went rogue and didn’t bother with the chopstick. Simply rub the oval with oil and fold it in half. 1. Mix together everything except the baking powder in the bowl of a stand mixer. Use the kneading hook to mix and then knead the mixture together for about 10 minutes. It will come together into a smooth dough. If you need, you can add a little more water but I’ve never needed to. 2. 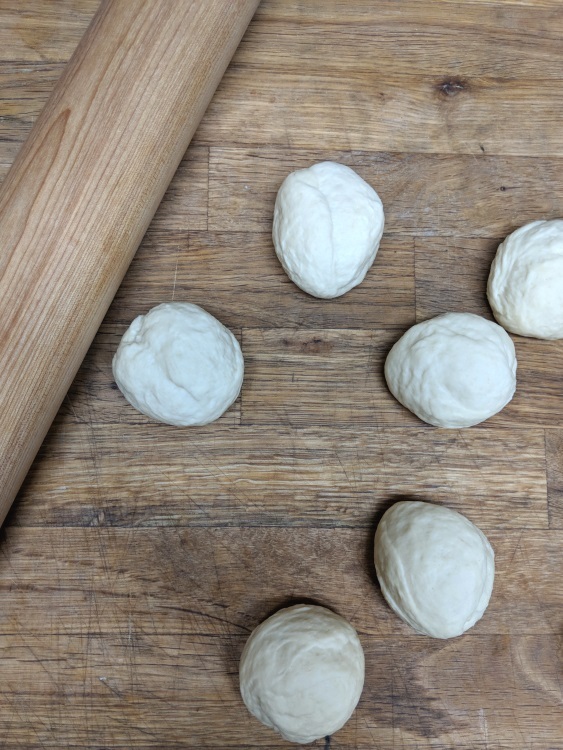 Place the dough into a lightly oiled bowl, cover it with cling wrap or a damp cloth and leave it to rise in a warm spot for 2 hours or until it has doubled in size. 3. Tip the dough out onto a clean work surface and punch it down. Flatten the dough with your hands, then sprinkle over the baking powder and knead for about 5 minutes. 4. Roll the dough into a long sausage shape 1-2 inches wide then cut the log into 18-20 pieces roughly 1-2 inches long. In the palm of your hand, roll each piece into a ball and leave to rest for 2-3 minutes. 5. 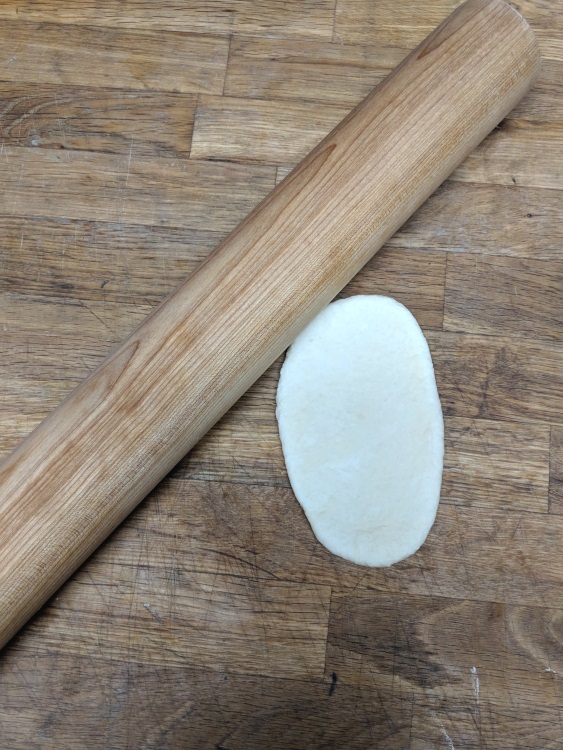 Use a rolling pin to roll out each ball into an oval shape about ¼ inch thick. Rub the surface of the dough ovals with oil and fold in half. Transfer the buns to a tray lined with parchment paper and cover with cling wrap or a damp towel. Leave it to prove in a warm place for 90 minutes or until doubled in size. 6. Heat a large steamer over medium-high heat. Use a sharp knife to cut the parchment paper around each bun. This will prevent the buns from sticking to your steamer and make them easier to handle. Load your steamer with as many buns as it can hold at once and steam for 8 minutes until they have puffed up. You can eat these right away, stuffed with your favorite fillings. I love them with some sriracha-mayo, pork belly, pickles and a sprinkle of toasted sesame seeds. They’re amazingly resilient and will keep in the fridge for a week in a Ziplock bag. Pop one in the microwave for 30 seconds and put a smear of Chinese mustard in it for a quick snack. No judgement. These will also freeze well after cooking. Put them on a tray to freeze without sticking together then bag them up. You can steam them from frozen for a few minutes until they’re defrosted and warmed through.